Based on what I know about myself right now, what I really want to do is reach people. I want to make great music, but I also want of hope where there might not be any in their lives. My name to use that talent to lift people up, and maybe show them some degree means ‘hope’ in Spanish, and it’s a name I want to live up to. 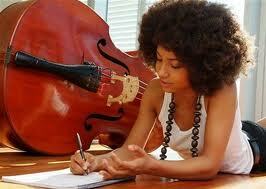 I remember when I first delved into the music of Esperanza Spalding (go here to view my lengthy profile of Esperanza Spalding). I was both impressed and curious. Of course, I liked how she handled the bass, however, my curiosity was flavored with a bit of skeptical anxiety. I liked what she was doing but could not discern what she was ultimately striving to achieve. Her third album, Chamber Music Society, is not a music box I open on a regular basis; I have never liked classical music as a genre even though I appreciated some classical compositions and am very impressed with the artistry of a handful of classical musicians. When I heard that Esperanza’s third album was promoted as having a contemporary music cast, that is, sounds that could find their home on urban radio, I thought oh no, here we go with another attempt to mix hip hop and jazz, which inevitably ends up diminishing the jazz content. Another wrinkle in my assessment was created by the fact that Robert Glasper’s new album was Black Radio. Could it be that both Esperanza and Robert were separately attempting to create a jazz-based fusion of contemporary sounds? Now that I have heard both, I realize that these are two very, very different approaches and that I am personally much more comfortable with what Esperanza has achieved. Part of my attraction and repulsion is that whereas Glasper is heavily hip hop influenced, Esperanza is drawing on other sources to shape her approach. In Glasper’s case I hear more hip hop and less jazz, whereas Esperanza definitely draws on a wider range of jazz and popular music styles. Although neither could be categorized as mainstream jazz, and indeed might more accurately be characterized as jazz-based contemporary music, both are obviously aimed at a broad, popular audience. I think one way to underscore their diverging approaches is that Glasper offers club music whereas Spalding presents concert hall music. Style-wise, Glasper reminds me of Herbie Hancock during his funk/fusion period and Spalding is analogous to Stevie Wonder. You can hear touches of classical chamber music mashed up next to Broadway show tunes, supper club/lounge lyrics followed and/or preceded by conscious protest music, classic R&B co-existing with big band jazz. Spalding’s album is an attractive quilt of musical genres unified by her attempt to use everything that’s part of her musical tastes within the context of creating music that one could possibly hear on the radio in any major metropolitan area worldwide. Esperanza is on a major label and since winning last year’s Grammy award, she currently has a major marketing push behind her new album. Undoubtedly there is a tremendous amount of pressure on her to be a commercial success. Fortunately, rather than crumble or stumble and produce trendy pap, Spalding’s response is to shine diamond bright. For example, at the 58th Academy Awards she was offered two major spots, the first a pre-telecast duo jam with Bobby McFerrin, and second a tribute solo rendition of “What A Wonderful World,” a song indelibly associated with Louis Armstrong. The “Wonderful World” turn was pure Hollywood, which means nothing of substance, yet she managed to imbue her vocals with a sincere optimism that made the lyrics sound believable. With McFerrin she did saxophonist Eddie Harris’ “Freedom Jazz Dance” featuring McFerrin beat-boxing and singing, with Spalding mostly playing acoustic bass and offering backing vocals. Both performances are included on the Mixtape, as is her performance at the Nobel Prize awards program at which she presented “Espera,” an original song advocating peace—and again she is on acoustic bass. For her new album she has switched primarily to electric bass. I hope that she remains primarily an instrumentalist but I also know there will be more and more pushes from marketing to make her over into an attractive songbird - that is - ditch the bass, just sing (and smile, and look adorable). Although her singing voice is attractive, she’s really a middleweight whose artistry is in how well she uses her instrument rather than the pure power of her sound. Like many, many jazz artists before her, she not only makes the best of her particular sound, she turns what might be thought of as a limitation into an idiosyncratic identifying strength. Clearly, rather than rely on schmalzy bombast or extra-musical schtiks, Esperanza relies on professional musicianship as the foundation on which she builds her performances. Clearly she has made the right choices. She is a strong performer, indeed, her live television presentation on Jon Stewart’s Daily Show of “Black Gold” and “Crowned and Kissed,” two songs from her new album, is even better than the studio recording. While the arrangements of both songs was generally the same as recorded, there was much more freedom and improvisation thusly emphasizing the jazz content. With her pixie-like statue tiara-ed by a massive afro, Esperanza Spalding is on the verge of making the major transition from primarily a jazz artist to a popular entertainer, a cross-over epitomized by Nat King Cole. Now the question is can she sustain her success? All indications thus far are that she will exceed our expectations. Kalamu ya Salaam is a writer and filmmaker from New Orleans. He is also the founder of Nommo Literary Society - a Black writers’ workshop.